The Groupe des Écoles Nationales d'Économie et Statistique (GENES), is a state run institution of higher education and research of the Ministry of Economy and Finance, under the technical supervision of the INSEE (French National Institute of Statistics). The transformation into a public institution on the 1st of January 2011 was intended and designed to make it possible for the schools, research laboratories, and the training center of the GENES to have the required agility, in the completely changing world of higher education and research in turmoil. This at a time when budgetary constraints to be faced require every single operator, to increase its own resources to finance its growth. After the success of the CASD's (Centre d'Accès Sécurisé aux Données en sciences humaines et sociales) Equipment Excellence in 2011, the GENES, via, the ENASE-CREST won a Laboratory of Excellence in "Economics and Decision Sciences" with the École Polytechnique and HEC, which is itself part of the Excellence Initiative of the University Paris-Saclay. Similarly, with its partners, the CREST won the "Major Area of Interest" call for projects, which had been launched by the Region Ile-de-France relating to labor and suffering at work. Furthermore, with the Paris School of Economics, the GENES created the Institute of Public Policies to widen the range of social and economic assessment tools to assess economic and social policies. As for the CASD is concerned, it dramatically expanded its offer of data access towards the French and foreign scientific community. It is now expanding to other European countries spurred by the European Commission and Eurostat. A significant number of new contracts, research chairs, and private-public collaborations were signed both at Rennes and Paris. 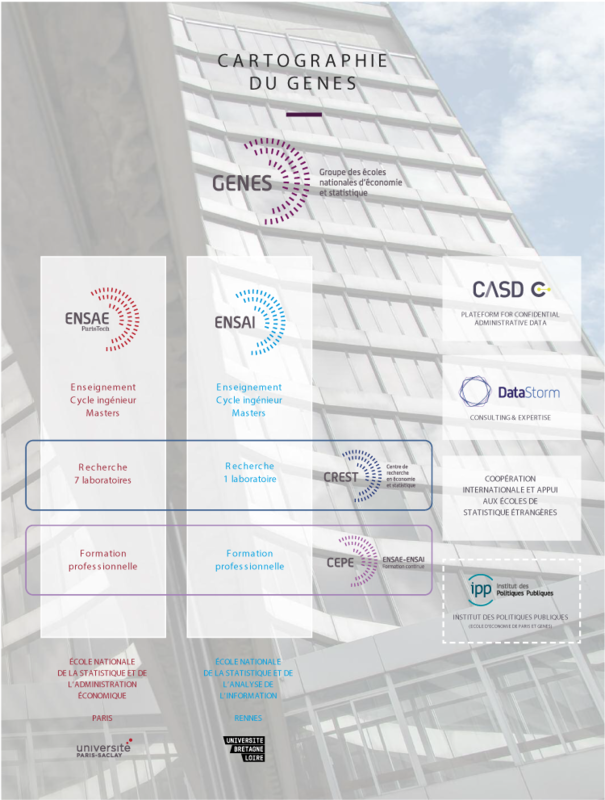 As a whole, thanks to the strong momentum of the ENSAE-ENSAI Formation Continue (Cepe)'s lifelong learning offer, GENES' own resources have grown significantly despite the difficult economic times. These successes validate the growth strategy of the GENES and its scientific strategy based on the idea that excellence in areas such as quantitative economics and social sciences, applied mathematics and quantitative methods, finance, actuarial sciences, marketing, statistics applied to medical science, computer science and information processing, is a major asset as far as our students opportunities and the research fields of the forthcoming decades are concerned. Eventually, we cannot but welcome the undeniable and growing success of our students in the marketplace despite a very unfavorable economic environment. The ENSAE ParisTech (École Nationale de la Statistique et de l'Administration Économique), forms statisticians, economists and Insee's administrators. The ENSAI (École Nationale de la Statistique et de l'Analyse de l'Information), forms statisticians and les attachés to the Insee. It is located in Rennes. A research center: the CREST (Centre de Recherche en Économie et STatistique). A secured access research data center: the CASD (Centre d'Accès Sécurisé aux Données). A lifelong learning center: the ENSAE-ENSAI Formation Continue (Cepe). The GENES also has a subsidiary of valuation. - Big Data and optimization of databases. With the creation of the Institut des politiques publiques, the Paris School of Economics (PSE) and CREST have two objectives: first, to develop a permanent team of researchers specialising in the economics of public policy; second, to inform the public debate with rigorous and widely accessible analysis. The IPP aims to facilitate research on public policy through in-depth institutional knowledge, systematic use of data and cutting edge methods. The IPP aims to disseminate its research findings to the wider public, beyond academic circles. To view the group's 2017 activity report, click on the pdf icon. To view the group's 2016 activity report, click on the pdf icon. To view the group's 2015 activity report, click on the pdf icon. To view the group's 2014 activity report, click on the pdf icon. To view the group's 2013 activity report, click on the pdf icon. To view the group's 2012 activity report, click on the pdf icon. To view the group's 2011 activity report, click on the pdf icon. To view the group's 2010 activity report, click on the pdf icon.